More "Diva" inspiration from the Design Team. 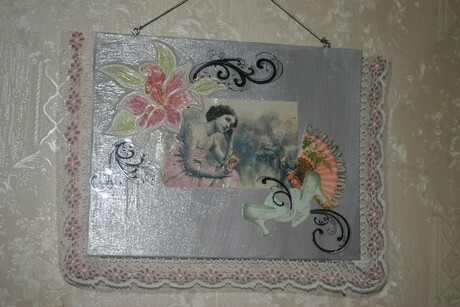 Here Vicki Romaine used one of my favorite images from my Diva collage sheet and combined it with other Lunagirl Images, acrylic paint, and a beautiful embroidered flower to create this pretty wall hanging. I love the different textures and the sense of movement! 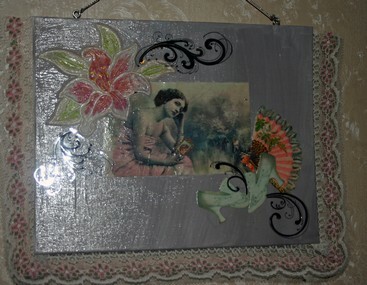 "The wall hanging uses three vintage sheets. They are the diva, shoes, and fan and mirror. If you look closely you will notice that I have super-imposed the mirror into the girl's hand. The background has gesso which was tinted with acrylic paint. 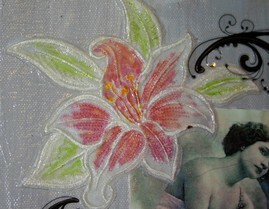 A number of years ago I cut a blouse up that had pretty embroidered flowers. I finally dug one out and used Copic markers to color the white flower. The entire piece has been Mod Podged." I hope you all will enter your Diva-inspired works in the latest Lunagirl Moonbeams Blog Challenge! More inspiration in the Design Team posts below, and inspiring diva/actress collage sheets here.